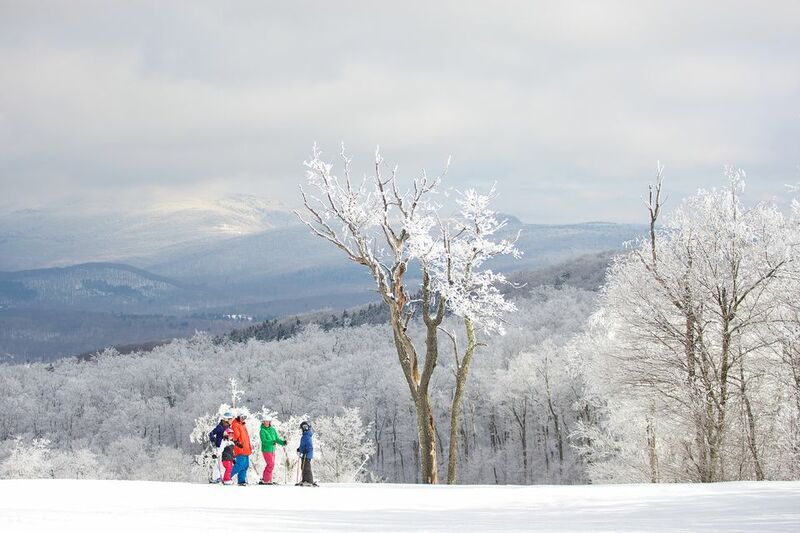 Jiminy Peak Ski Resort is the largest ski and snowboard resort in southern New England. It sits in the middle of the Berkshires in the town of Hancock, Massachusetts. The resort is a 45 minutes away from Albany, a 2.5-hour drivefrom Boston, and three hours from New York City. The Berkshires themselves are a popular tourist destination in the Northeast, especially beautiful during peak fall foliage season times or while covered in snow in the winter. During a typical season, the resort sees 300 inches of snowfall. The base elevation at Jiminy Peak is 1,245 feet and the top elevation is 2,375 feet. The resort has 9 lifts in total (1 six-passenger high-speed summit lift, the Berkshire Express, 1 double chairlift, the Grand Slam Double, 2 quad chair lifts, Widow White’s Quad and Whitetail Quad, 2 surface lifts, and 3 triple chair lifts, the Novice, Summit, and Cricket triples). Twenty-one of the 45 trails are lit up for night skiing. Our favorite feature of Jiminy Peak? It’s the only ski resort in North America to generate all of its own energy using wind turbines. Jiminy Peak Ski Resort has 167 skiable acres; a 1,150 vertical rise; 38% beginner; 13% beginner/intermediate; 16% intermediate; 13% intermediate/expert; 20% expert/advanced. Advanced: At Jiminy Peak, you’ll find just three double-black-diamond trails: Jericho, Upper Exhibition, and Upper Lift Line. Black diamonds include Ace of Spades, Upper Whirlaway, Upper Whitetail, Lower Whitetail, Wild Turkey, and Cutter. Black diamonds which may also be appropriate for intermediate skiers are North Glade, Upper Fox, Lower Exhibition, Bear Crossing, Nor’easter, and Catacombs. Intermediate: Along with beginner/intermediate and intermediate/advanced trails, you’ll find Panorama, Riptide, 360, Lower Fox, Exhibition East, Hot Wheels Glade, and The Mogul Thing. Beginner: At the base of the mountain, find beginner trails Chipmunk, Jiminy Cricket, and 180. Round-a-bout, Outback, and Glider are at the summit. Other beginners trails are scattered throughout. More challenging beginner trails also appropriate for intermediate skiers include West Way, Grand Slam, Willie’s Gulch, Raccoon’s Den, Out to Sea, and Scooter. One-day lift tickets purchased at the window begin at $76 for adults (19-24), $66 for young adult (13-18) or seniors (65+), and $56 for children (12 and under) on non-holidays. Holiday tickets begin at $83 for adults, $72 for young adults and seniors, and $62 for children. Holidays for the 2017-2018 season include December 25, 2017 to January 1, 2018, January 15 to 17, and February 17 to 25. Discounts are offered for lower mountain lifts, 4-hour lift tickets, twilight packages (3 p.m. to 10 p.m.), 2-day and 3-day packages, and tickets obtained online in advance, with larger discounts the earlier in advance. While offering fewer options than larger ski resorts, you won’t go hungry (or thirsty) at Jiminy Peak Ski Resort. Please note that many of the below are only open on weekends and holidays. If you’d like more options, the Berkshires themselves have many restaurants and bars. John Harvard’s Restaurant and Brewery: On the third floor of Country Inn, find a rustic restaurant with pub fare and several styles of award-winning craft beer. There are weekly specials and live music is often performed. Christiansen’s Tavern: For pub fare (think award-winning chicken wings), surrounded by the game on the big screen in a rustic setting, visit Christiansen’s Tavern, open for lunch and dinner daily and breakfast on weekends and holidays. JJ’s Lodge: The food court at JJ’s Lodge offers burgers, pizzas, burritos, soups, salads, and chilies, along with many kid-friendly options. Try the cinnamon rolls and John Harvard’s handcrafted beer (though maybe not together). In the lodge on weekends and holidays, you’ll also find Powder Maker Donuts (on the patio), and Drifted In Coffee and Spirits. Peak Sweets: In the courtyard of Village Center, find organic coffee and locally made chocolates (closed Tuesday through Thursday). Wicked Char: For winter comfort food like smoked meats, pizza, mac and cheese, and soups, visit Wicked Char in the Crane Lodge (open weekends and holidays). Hendrick’s: Typically open daily but also subject to guest volume and weather, find hot beverages, soups, baked goods, grill fare, and snacks at Hendrick's Summit Lodge. The Country Store at Jiminy Peak: For grab-and-go snacks and meals as well as a selection of wine and beer, visit the Country Store, open daily. In the upper courtyard of Village Center within the Thatcher Building, you’ll find all your rental necessities. During the 2017-2018 season, borrow either skis, boots, and poles or a Burton snowboard and boots for $43 for a full day and $39 for any days after that. Helmets are $10 a day and wrist guards, if needed, are free. If your child is participating in the KidsRule Mountain Camp, you can rent equipment at the Burbank Children’s Center. Likewise, for students of the Get Skiing and Snowboarding Center, there is a rental shop at Doc Maynard. For $50 a day, you can demo equipment from such names as Volkl, Rossignol, Atomic, K2, Blizzard, Ramp, Fischer, Burton, and Captiva at Mountain Sports by Potter Brothers in the Burbank Center. There you can also find a large selection of ski and snowboard equipment for purchase along with cold weather clothing and accessories. Buy souvenirs and resort-branded items at Just Jiminy in the Paul Major Welcome Center. The children’s programs at Jiminy Peak have received national recognition. KidsRule mountain camps provide a full-day of instruction for children ages 3-14 that includes a lift ticket, lessons, and lunch. Adults and children can also learn in private lessons or 80-minute group lessons or with the Get Skiing and Snowboarding program for beginners, lessons that build on each other and include rentals and lift tickets. Multi-week packages and adaptive lessons for skiers with different abilities are also available. Mountain Roller Coaster: Jiminy Peak’s mountain coaster was the first in New England and the second in the U.S. when it was installed in 2006. Fly through 3,600 feet of the woods and take in the scenery and the thrill at the same time. You control the speed of your car that can fly up to 23 miles an hour. Children under 3 are not allowed to ride and children under 9 are not allowed to ride without an adult age 16 and up. Snowshoeing: For a relaxing aerobic workout, rent snowshoes from Mountain Sports by Potters Brothers and explore the Nordic trails (free of ski and snowboard traffic) on the west side of the mountain past John Hancock trail. Zip Line: Get transported 800 feet into the air and then zip down quickly for a thrill you can share alongside someone else. Buy tickets for the zipline ($7 for one ride, $12 for two) at the ticket window in Crane Lodge or at the front desk of the Country Inn. There are height requirements and weight limitations for this ride. Country Inn: Jiminy Peak’s on-site hotel provides amenities including an outdoor heated pool, indoor/outdoor whirlpools, spa services, and an exercise room with machines and weights. Vacation Homes: Larger groups and families might enjoy renting a home for more space. On the resort, these are available at Mountainside, Village Center, Country Village, or Beaver Pond.